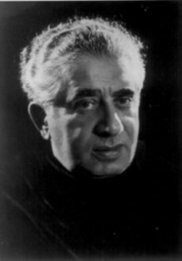 Aram Ilich Khachaturian was born near Tiflis on 6 June 1903 and died in Moscow on 1 May 1978. Educated at the Gnesin School and the Moscow Conservatory, Khachaturian emerged — along with Prokofiev and Shostakovich — as one of the most popular and successful composers of the Soviet period. His unique musical idiom was indelibly marked by his Armenian heritage; his scores are noted for their sensuous, singing melodic writing, colorful orchestration, and elemental rhythmic drive. Known in the West chiefly as the composer of instrumental concerti and the vivid scores for the ballets Gayaneh and Spartacus (the former including the brilliant 'Sabre Dance'), his output also encompassed symphonies and other works for orchestra, film and theater music, works for band, chamber music, and a large number of patriotic and popular songs.